Do you have other stuff to check out besides books? How long can I keep a movie? What happens if my stuff is overdue? Can I put a hold on a book that is checked out to someone else? Does the library have any computers connected to the Internet that I can use? Do I have to have a card to use the computers? Can I print things from the library’s computers? Can I play my wireless game or use my wireless laptop in the library? Can I send a fax? Can I scan things into a computer at the library? Can I use my flash drive at the library? What happens if I want a book the library doesn’t have? How can I renew my stuff? All residents and property owners in the Town of Roanoke are eligible for a card. Come into the library; fill out an application; present proof of your residency- a driver’s license or utility bill with your current Roanoke address; and you will be given a library card at no charge, as long as you live within the town limits. 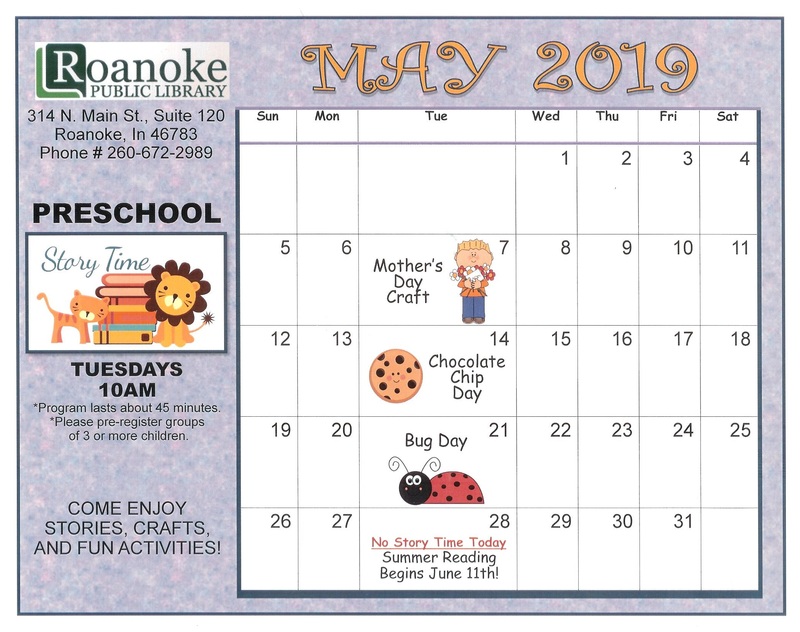 Non-residents of the Town of Roanoke may obtain a library card for an annual fee of $55. Books and other print materials are loaned for 21 days. Audio books and audio tapes are also loaned for 21 days. The library has magazines, music CDs, audio books, books with CDs, DVDs and Blu-rays. DVD and Blu-rays are loaned for 7 days. Fines are assessed for items held beyond their due date; 25¢ a day for books, other print materials, audio books, audio tapes, DVD and Blu-rays. You may place a checked-out book on hold for you to be contacted when it is returned. This can be done online through your library account or the library staff 😆 can do it for you. 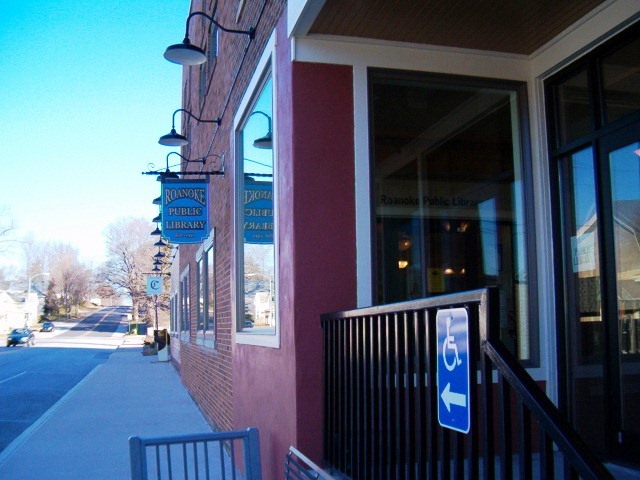 You can place a hold on books not only owned by the Roanoke Public Library, but on those owned by any of the libraries that are a part of the Evergreen Indiana system. Does the library have any computer connected to the Internet that I can use? The Roanoke Public Library has 6 computers that are open to the public. All are connected to the Internet. No, you only have to sign in on a clipboard to use the computer. If you are under 18 years of age you must have your parent/guardian sign a RPL Parental Consent Form Computer & Internet. Printing from the computers is available at 10¢ a page for black & white and 30¢ a page for color. Yes, the Roanoke Public Library is a FREE wireless Internet hub. A black and white copy machine is available and copies can be made at 10¢ a page for single side; 15¢ for double-sided; 15¢ for legal size; 25¢ for double-sided legal size; 20¢ a page for single sided 11 1/2″ x 16″ and 30¢ a page for double-sided 11 1/2″ x 16″. A color copy machine is available and color copies can be made at 30¢ a page for single side; 45¢ for double-sided, 45¢ for legal size, 75¢ for double-sided legal size; 60¢ a page for single sided 11 1/2″ x 16″ and 90¢ a page for double-sided 11 1/2″ x 16″. A color printer is available also and copies can be made at $.30 a page for single side; $.45 for double-sided; $.45 for legal size; $.75 for double-sided legal size; $.60 a page for single sided 11 1/2″ x 16″ and $.90 a page for double-sided 11 1/2″x 16″. Black and white copies from the printer can be made at 10¢ a page for single side; 15¢ for double-sided; 15¢ for legal size; 25¢ for double-sided legal size; 20¢ a page for single sided 11 1/2″ x 16″ and 30¢ a page for double-sided 11 1/2″ x 16″. The library staff 😛 will fax your papers at $1.00 for the first 5 pages and then 25¢ for each additional page. You may receive faxes at the library at the same cost schedule as sending-$1 for the first 5 pages and then 25¢ for each additional page. The library staff 😆 can assist you in scanning pages, pictures or other printed materials. These items can then be printed or sent to an email address. Scanning is at the same cost schedule as faxing-$1 for the first 5 pages and then 25¢ for each additional page. Yes, the library allows the use of flash drives. All of the public computers have USB ports in the front of the computer tower for easy access. Ask! The library staff may be able to borrow the book from another library in the Evergreen Indiana system or the more widespread system of Inter-library loans. There is no cost involved-unless the item comes from outside of Indiana and then a charge for the postage will be accessed. Things can be renewed by coming into the library and asking the staff to renew them or you may call the library at 260-672-2989 and ask over the phone or you can log into your account on the computer and renew. Books, magazines and audio-books can be renewed 2 times, but movies can only be renewed 1 time. 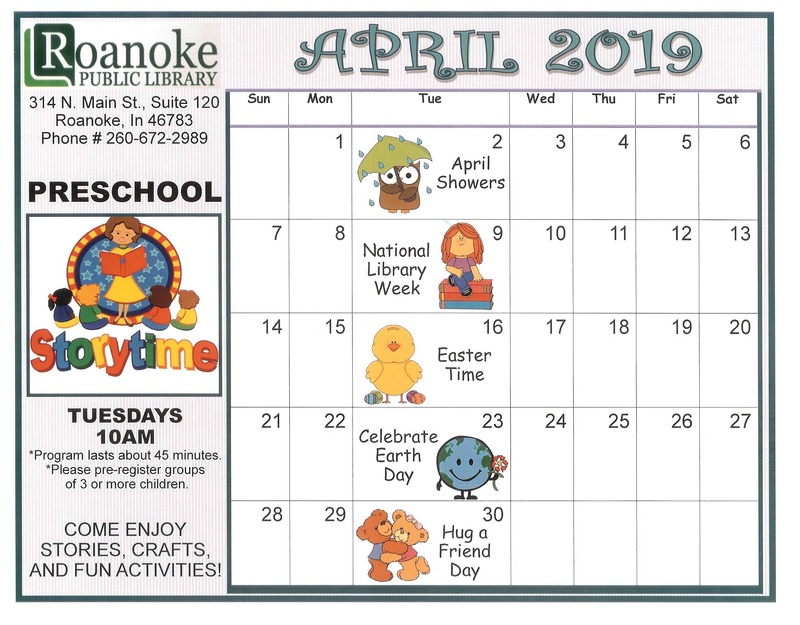 Yes, the Roanoke Public Library is part of the Evergreen Indiana system so the Roanoke Evergreen Indiana card is acceptable at any participating library. For a list of the member libraries, click Evergreen Indiana. Huntington and Allen County are NOT part of the system, but Andrews-Dallas Township and Warren Public Libraries are. To be able to borrow materials from ALL public library in Indiana, once you have your Roanoke card, you can purchase a PLAC (public library access card) for $65 which is good for one year. It's Monday 6:09 PM — We're open . Come visit us.